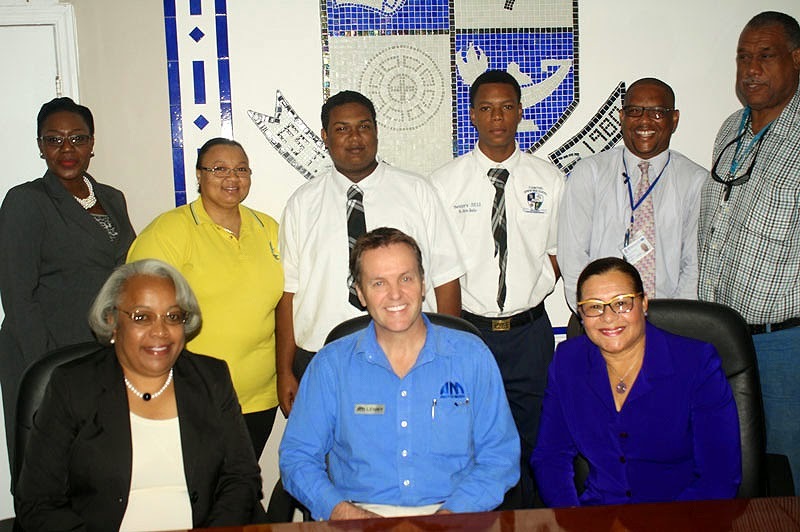 DESERVING STUDENTS: Two seniors of C. V. Bethel High School are the most recent recipients of The Bahamas Motor Dealers Association scholarships to study Auto Mechanics at The Bahamas Technical and Vocational Institute (BTVI). Edrin Bodie and Kishon Ramburun have each been awarded $1,500 by the association based on their exemplary performance in Auto Mechanics. Both young men are expected to begin studying towards a certificate in Auto Mechanics in fall 2015. BTVI’s 2013 Motor Dealers Association scholarship recipients were Baltrum Kinglocke and Ricardo Cunningham. Standing from left to right are: BTVI’s Dean of Academic Studies, Pleshette McPhee; parent, Gloria Ramburun; recipient, Kishon Ramburun, recipient; Edrin Bodie; BTVI’s Dean of Construction and Mechanical Trades, Alexander Darville and C. V. Bethel Auto Mechanics teacher, Carl Nottage. Seated from left to right are: Auto Mall’s Human Resources Manager, Carol Bowleg, who presented the cheque on behalf of the association; Auto Mall’s Service Manager and Tech Trainer, Lenny Henderson and BTVI’s Manager and Consultant, Dr. Iva Dahl.